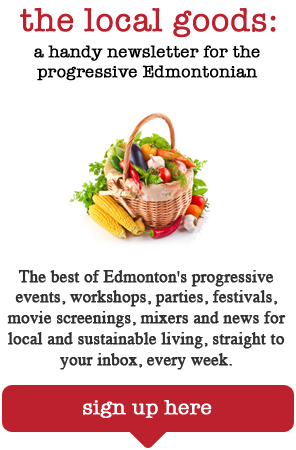 Before I began writing for The Local Good, I can admit that I was a little more oblivious to the goings on in Edmonton. Apart from our large annual festivals and the concerts rolling through town, I wasn’t really aware of the sheer volume of smaller events that were taking place right under my nose. Free apps such as Eventbrite have helped to open my eyes and keep me updated on a variety of happenings that are food, business, community or arts related — the types of events that I might have an interest in. However, telling stories for this blog, and meeting the others who do the same, have further expanded my knowledge of what the people of Edmonton are capable of. 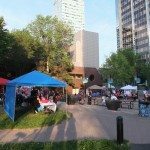 As I scrolled through a list of potential ideas that the blog team has saved over time, I stumbled upon a note about Night Market Edmonton (NME). Reminded of my visit to the International Summer Night Market (considered one of the best in the world) in Richmond during a trip to Vancouver several years ago, I was excited to hear that someone had thought to attempt it here. A performer entertaining NME visitors. Photo by Crystal Lee. Night Market Edmonton on Jasper Ave. & 105 St. Photo by Crystal Lee. Vendors and picnic tables at NME. Photo by Crystal Lee. The NME sign and vendors. Photo by Crystal Lee. Movie tent at NME. Photo by Crystal Lee. To my surprise, 2015 will mark NME’s third summer season. Where had I been this entire time? It turns out that in 2013, the original location was off Jasper Avenue, at 102 Avenue and 106 Street. Honestly, it wasn’t the most visible location for those passing through the downtown core. Also, the mentality still exists that not much occurs in the area after 6 p.m. on a weeknight — the office buildings clear out and the streets are empty until the bars and clubs open their doors to the late-night revelers. It makes for an unfriendly picture of what should be an otherwise bustling place at all hours of the day. Trina Shipanoff, general manager of NME, struck out to change that. In year two, the market moved to Beaverhill House Park where it remains situated. The change of venue gives NME increased notice by being right on the main strip, and the oft empty space, which, at times, has a less-than-positive reputation, is given a more creative use. The second week of this season, I happened to pass by as my friends and I headed to a nearby bar. With less than an hour before the market closed for the night, there were still some people lingering around the tables and even a few couples dancing under the starlight. I was interested to see what it would be like earlier in the evening. So, this past Friday, I ventured back downtown to take a walk at around 8 o’clock. I go by this park fairly regularly as I work just several blocks away, but I have never really paid much attention to the size of the lot itself. It certainly isn’t large enough to accommodate anything near what you would find in Richmond, but there is more room than I thought. With less 20 vendors selling food or goods on this particular evening, this is a market that is still in its infancy. The time I spent was enjoyable though. The atmosphere is relaxed on a warm spring or summer evening. 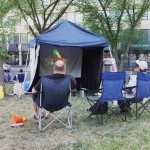 A few people staked their place with portable lawn chairs in front of a tented screen showing a FIFA-themed movie: Will Ferrell’s Kicking & Screaming. 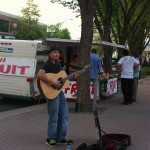 Two singers — one next to the fruit stand and the other standing in the middle of the picnic tables — strummed their guitars for those who ambled by. A tarot card reader with a small table explained to a customer how she got into fortune telling. A young chocolatier, Brian Greening of Chocolate Haven, described the process of his craft to me. Everyone was open to conversing, to getting to know one another, to sharing a smile. In essence, the market has done its job. It has brought strangers together. 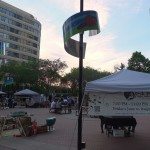 What differentiates this public market from the others in Edmonton, apart from the late hours, is that the organizers are open to working with various types of vendors. This spans anywhere from painters to food trucks to goods that are not exclusively handcrafted or homemade — such as Jamberry Nails and Color by Amber — and everything in between. With over 1,000 likes on Facebook, NME has its fans. Yet, there are so many more who are still unaware of its presence. 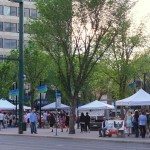 The beauty of being located at Beaverhill House Park is that the market benefits from the foot traffic on Jasper Avenue, and while that is great, it only goes so far. 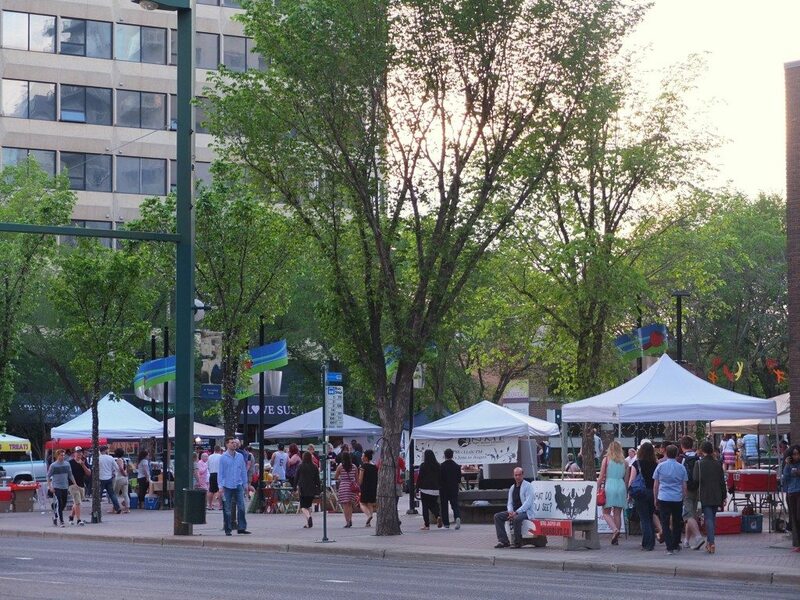 Even in such a small park, the night market can be a true gathering space for Edmontonians. NME holds in its hands so much potential, and I truly hope that it sees greater success as they continue to forge stories by bringing compelling people together every Friday during our long summer evenings.